Today’s plan: Jerash and Elijah’s birth place in Ajloun (Mar Elias). Transport is scarce on Fridays in Jordan so the North bus station was unusually empty. I sat on a bench with Susanne, a Dutch girl staying on the roof of the hostel, and simply waited. Not knowing when the next bus would arrive, we just sat, reading our books. It didn’t matter what time it was, or how long we were there for. Falling in to the natural rhythm of time as it flows without keeping track of it’s rigid unit of 30 minutes is a bliss of travelling. Time stops tick tocking and I find rest in it’s silence. On the bus to Jerash, our conversation turns to feminist issues: How does it feel like to be covered up in public spaces? Does our freedom to reveal however much we want in the West cause sexualisation of women to be more overt? The proportion of women walking around on the streets of Jordan is visibly much lower than the number of men, and the amount of attention we draw as foreign women made me very conscious of my identity as a female and the dynamics between different sexes. Women may have a quieter role in the society here, but men in return seems to assume more of a protective and responsible role than the men in the West. It made me rethink about my ignorant tendency to equate such cultures with gender inequality that needs transforming. 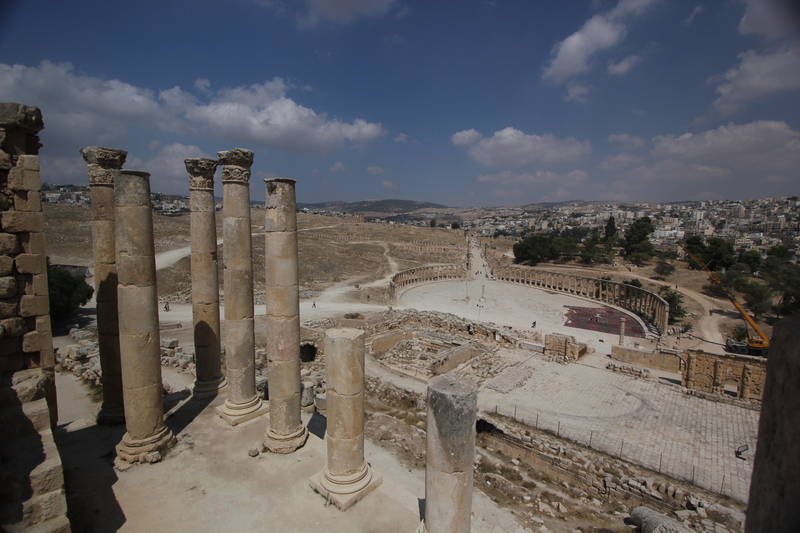 Jerash is one of the Middle East’s best examples of a Roman provincial city, comprising a collection of triumphal arches, amphitheatres, a hippodrome and temples. Susanne decides not to go in so I enter by myself. It is so much bigger than I expected, and I find it a chore dipping my head into my travel book to read about each ruins when I would rather spend my time taking in the ancient view. ‘I would love an audio guide’, I think to myself. Then, as if by magic, a young boy approaches me and asks, ‘Do you need a guide?’. He seems very young and there’s no way of telling whether he’s a real guide or not. In his Arabic accent he carries on talking. ‘Moving columns, goats, lions, empty stones – I tell you all about. You know moving columns? I tell you all’. Moving columns? Goats? I can’t make out what he’s trying to say from what seems to be a random collection of words, and his thick Arabic accent adds to my suspicion that it’s a scam. I say ‘no thank you’ but he still takes me to a nearby ruin anyway. ‘Here, the view is really good’, and he climbs up the stairs inside a small, insignificant tower nearby. The view IS really amazing and at this I decide to put a little faith in him. The boy really knew his stuff. He shows me how the columns were designed to move a little, and the stones on the buildings are hollow so that they would make a sound when they clash into each other – so that one would know when there was an earthquake and the buildings are less likely to collapse. He shows me where people used to sacrifice animals and a stone with knife marks on them and and where all the meat used to be stored. 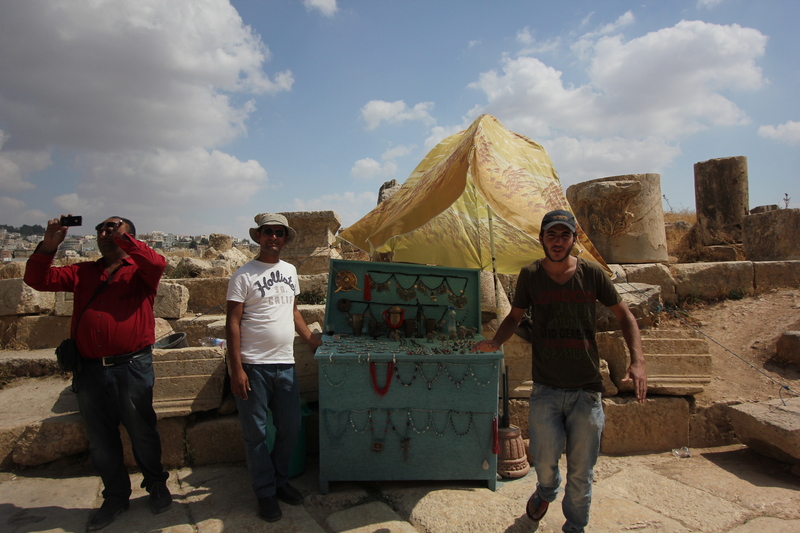 He knew all the people working in Jerash, so we stopped by a vendor and chatted a little. I bought two silver bracelets for 10 JD, which the vendor told me were from Jerash (I later found Chinese letters engraved on the bracelet, and they were being sold in Petra for 3 JD). Mohammed, my guide, picked up a green bead necklace from the stall, said something to the vendor in Arabic and gave it to me saying it was a gift. He told me the stones were also from Jerash, and then took me to a nearby stone all covered with brown sand. When he splashed some water on it, the stone revealed its true colour of deep green, the same colour as the necklace. As we were about to leave, Mohammed picked up another jewel from the stall and said, ‘it’s my gift to you’. I found it a little uncomfortable to accept another gift from a stall that isn’t even Mohammed’s so I discretely put it back where it was. The vendor saw this and told me to take it. To say thank you, I handed Mohammed a lemon sherbert I had bought in England to give to people Jordan but he refused. When I asked why he said it would make him want water all the time. So put it in my mouth instead for some energy perk up (I had no lunch and was starving), but soon spat it out. It was as if the sweet sucked all the moisture in my mouth and I couldn’t stand the thirst it created. It dawned on me why many had declined the sweets when I had offered it to them. It was a windy day, and wearing a flared skirt was not a good idea at all, as the moment of misfortune finally came with a gust of wind and.. well, you can imagine what it did to my skirt. More unfortunate was that Mohammed happened to be at the bottom of the stairs looking up at me, just at that moment. ‘This is the end of the tour’, he says when we are at the Temple of Artemis. ‘Can I have a kiss?’ You can have your money back’. Just a few minutes ago he wanted me to pay him much more than what we had agreed on (and I did end up paying him much more as I felt he was that good), and now we wants a kiss instead. First he asks for a kiss on the lips, and asks to kiss me on my arms and my legs. At my constant refusal he changes his tact. ‘Ok, we just say goodbye in Arabic style’. I naively believe he’ll let it go after a kiss on my cheek, but no, it’s my neck he goes after. ‘That’s not Arabic style!’ I still have my smiles on, hoping to be polite. ‘Ok, we’ll just take pictures together then’. He gets his phone out and sits on one of the stones. He purposely leaves a little space next to him and gestures to me to sit on his lap. I make him move over. ‘Why can’t I kiss your legs?’ ‘Can I kiss your arms?’ He asks again and I finally snap at this never ending insistence. I get up and announce, ‘I’m leaving now’. He follows after me, his eyes desperate and even looks a little hurt by my sudden rush of anger and determined refusal. ‘I’m so sorry. I’m too hot for a girl.’ He takes out the money I had given him and tries to give them back to me. I’ve just had enough. Without replying, I just walk off. He follows. ‘Give me high five’, he says. ‘No!’ My voice is high with irritation. ‘Just a high five’. He puts his palm out to me. Awkwardly I high five him and we both walk off in separate directions. I hate leaving on bad terms with people, even if it’s with someone I will never see again. Unfortunately, he wasn’t the only person I ended up storming off from during my travels in Jordan. I think you had the same guide as me (if the guide is the guy on the far right of the last picture). He looks the same. I have a video I took of mine… https://www.youtube.com/watch?v=YRdYM3yP4_4 Sad to hear that he was so creepy towards you. I’ve actually never had a problem with men in Jordan anytime I’ve been wandering on my own there! I absolutely loved your video! And it also made me miss Jordan even more. Yes, that’s the guy in the video is the same one as in the photo, but he wasn’t my guide. He did offer to take me to Aqaba though! I wouldn’t say I had trouble with men but a lot of them did try to make advancements in one way or another when they found out I was single and travelling alone.